Protect your eyeglasses in his unique triangle shaped eyeglass case. The fabric lined exterior features a Cherry Blossom and Fleur print. The magnetic closure keeps the case securely closed. The lined interior will not scratch up the lenses. The case is great for work, home, or school settings. The sturdy case with a flat bottom stands up right. 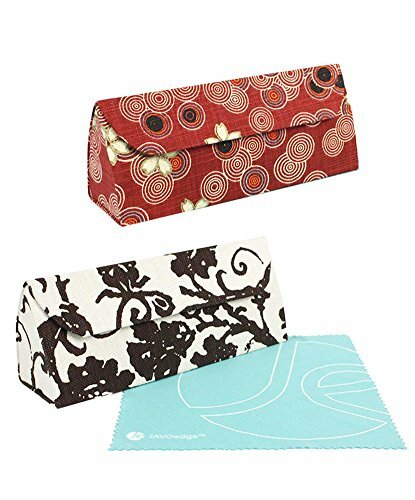 Keep your eyeglasses protected by storing them in this beautiful Cherry Blossom and Fleur triangle eyeglass case. TRIANGLE SHAPE CASE (L x W x H): Approx. 6.4 x 1.8 x 2.3 inches. Perfect for Small or Medium Sized Eyeglasses and Reading Glasses. STYLISH: Protect your eyewear wherever you go and for any occasion. Easy to fit into a purse or bag, also looks great at your desk at home or work, traveling, for storage, or at school. DURABLE: Made with a durable exterior shell that is lined both inside & outside with fabric to protect against falls, scratches & dents. The case provides excellent protection while being lightweight and easy to carry. It offers a magnetic enclosure as well to keep your belongings safe. If you have any questions about this product by JAVOedge, contact us by completing and submitting the form below. If you are looking for a specif part number, please include it with your message.